Fast day soup equals happy tummy, in fact any day soup equals happy tummy, but knowing it is helping you lose weight makes it even more special. 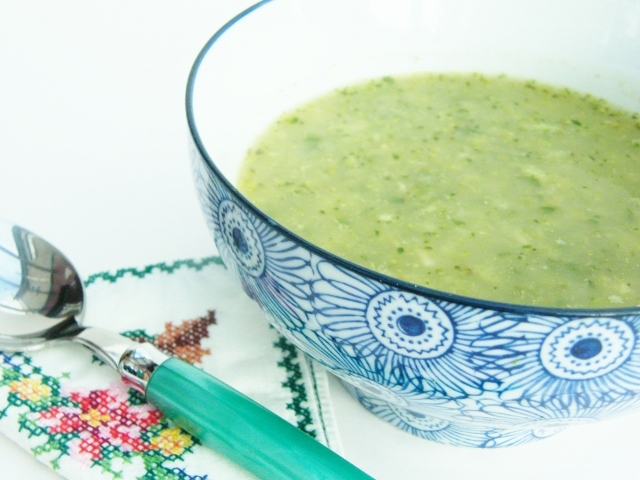 A simple, fresh green soup that is frugal too. Broccoli, potato, celery and a bag of mixed leaves that needed used up were the base for this soup. Oh yes and did I mention it is only 111 calories per portion? No! Silly me! I thought is was slurpingly good and Cooper loved it. Graham was a bit more blasé about it, saying it wasn't one of his favourites. Honestly! Sometimes I despair!! Here is Cooper enjoying his soup. I made it during the day for our evening meal, but Cooper couldn't wait and wanted a cup of yummy soup right away. It was a bit hot, so I put a splosh of milk in his. I do hope you give it a go. It's super good and on feast days it would be nice with that splosh of milk I added for Cooper or even some brie or blue cheese added. 1. Saute the onion, garlic and celery in the olive oil in a large pan until the onion is soft and translucent. 2. Add the rest of the ingredients and bring to the boil. Reduce to a simmer and cook for 30 minutes until the potatoes are tender.3. Whizz until nearly smooth. I like to leave some texture in my soup.4. Season. 5. Enjoy! That is one of the few things he is great with soups and smoothies. Sylvia is way better at whole veg. I love soups Jacqueline and this look awesome and Cooper is so cute!!! Oh I could have made this soup today if I hadnt used up my broccoli last night as I had all these ingredients to hand. I love the super healthy aspect of this soup and after too many cakes in this house it would be a good anitdote! Thanks for a super nutritious entry to Credit Crunch Munch! Ah, I would never have thought of blending celery into a soup - clever idea. It is a frugal vegetable if I have ever heard of one. And it sounds delicious. I usually have some and often pop it in soup. It does add flavour and I love the smell of celery. There are fields near us, that waft the smell of celery. Mmmmmmmmmm! 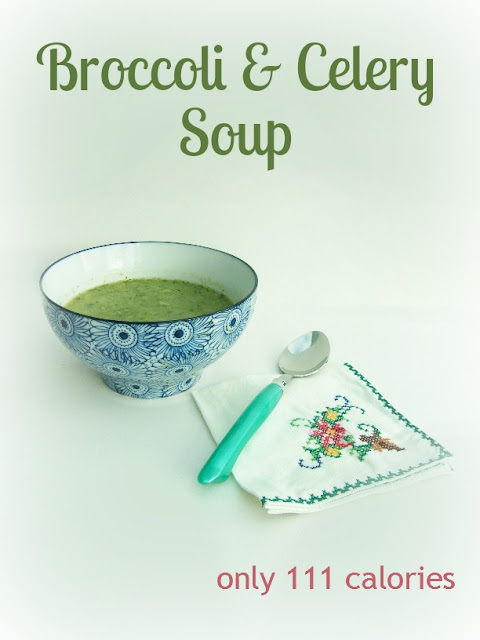 The first time I made broccoli soup for my kids I was surprised and delighted they ate it, too! So I made cauliflower soup and then butternut squash soup, and all were equally enjoyed. The real surprise for me was when they began requesting these soups. Cooper's got good taste! Yay! Isn't it great when it goes well like that? Me too Rachel, although I usually want a break from it come the Summer. Winter just lasts way too long! It is good. Well worth making.